Cybersecurity has never been more important than it is today. The cost of cybercrime in New Zealand as reported by CERT NZ, is in the millions of dollars per quarter. Attacks by cybercriminals involving identity theft, exfiltration of information and extortion using ransomware and other techniques are occurring all around the world at unprecedented levels. ALGIM is all about creating opportunities and sharing knowledge to enable Councils to thrive in an interconnected world and exploit the digital paradigm, however at the same time your information and your citizens’ information has become an internationally valuable commodity. One of ALGIM’s goals is to take a proactive approach and make a positive impact on the overall cybersecurity status of New Zealand Councils. 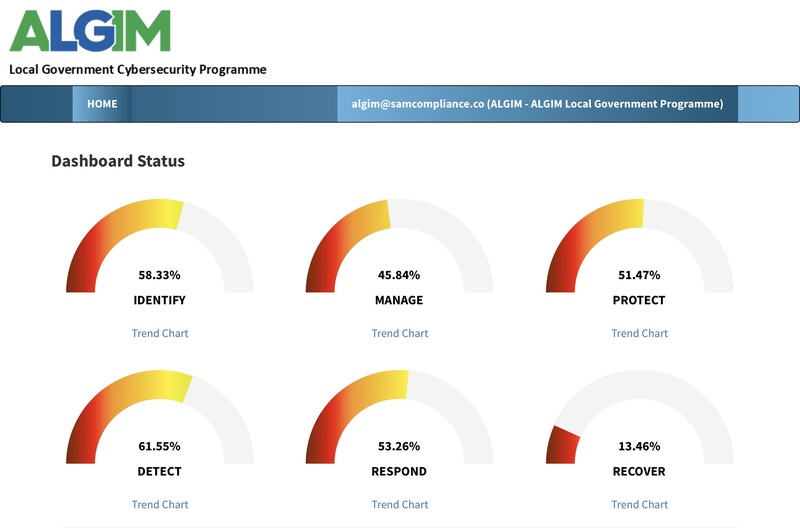 ALGIM has defined a cybersecurity framework which is powered by SAM for Compliance giving Councils the ability to manage and reduce organisational cybersecurity related risk. As part of the programme, Councils that demonstrate defined levels of achievement and improvement will receive awards at the ALGIM annual conference. Councils participating in the programme will be able to identify whether they are above or below average as compared to their peers. ALGIM will be able to identify areas where Councils are struggling to make headway and offer tailored workshops and training to assist if needed. To find out more, including pricing, use our registration of interest form, or if you're keen to join up, you can sign up for the programme. The more Councils that participate in the programme, the more effective it will be.